Challenge Yourself and Others to Greatness! We urgently need leaders today. Are you adequately rewarded for your efforts – recognized for your contribution, and held in high esteem by everyone around you? Has your life turned out as you had hoped it would? Are you living the life you really want? Are you satisfied with where you’re headed? Are you getting there fast enough? This talent can put you in total control of your life and make your dreams a reality. It can move your career onto the fast track and bring you high levels of prestige. It can make you a powerful communicator with vast influence over others. Plus, it can improve your relationships, your decision-making ability, and your peace of mind about your life and where it’s headed. I’m talking about the skill of leadership. As you know, we’re in the middle of a technological revolution. Seems almost every day, you read about newer, faster computer chips, biotech breakthroughs, and the global Internet. Yet in the midst of all this progress, more and more people feel isolated from one another, disconnected from their roots and unsure of their future. This is because, in a world quickly becoming more virtual, the skill of human relations is quickly being lost – and along with it, the skill of leadership. We urgently need leaders today. Our future as a nation depends on it. Plus, it’s in your own best interest to become a leadership master because when you develop your leadership ability, you will be rewarded beyond your expectations. With The Dale Carnegie Leadership Mastery Course, you can benefit from the insight that nine decades and millions of students have brought to the Dale Carnegie Organization. No other source can bring you the timely, relevant, up-to-date information on the vital skill of leadership mastery as they can. Get family, friends, and coworkers to do what you ask because they want to do it, not because they have to. Accomplish twice as much by learning to motivate other people to perform at their best and work together effectively. Leadership mastery involves seeing people, environments, and circumstances freshly, as if for the first time. And the truth is, we really are seeing everything for the first time because everything is constantly changing at an ever-increasing rate of speed. You’ll be respected as a person of action who’s an invaluable team player and who knows how to get things done. Your value will multiply because of your ability to motivate other people to perform at their best and work together effectively. You’ll be well-like and well-respected because you know how to respond effectively when under crisis. At the same time, you’ll also know how to challenge people with expectations and responsibilities. You’ll know how to get the most out of people without making the mistakes other leaders commonly make. You’ll know how to build loyalty, instill confidence in team members, and bring out their creativity. And as you hone these skills, your company’s bottom line will inevitably improve. The only way to differentiate yourself in your career and personal life is to become exceptionally skilled at leading yourself and others. Leadership can completely transform your life and your ability to make things happen. – in a positive way. In fact, other people will want to do what you ask them because of the simple, practical techniques you’ll learn. This new type of leader can be you! The first step you must take is to ask yourself, do you believe leaders are born that way, or do you believe leaders are made – not born? In other words, is leadership in someone’s genes, or do you develop it through experience and training? When you listen to this course, you’ll learn a series of principles, some of which are cutting-edge and some of which are proven, timeless leadership standards that never change. When you become an effective leader of your own life, you can then use the same principles to become a true leadership master, with vast influences over others. This course will teach you how to motivate yourself and others to reach new heights of accomplishment. It will teach you how to find and utilize mentors who will help you develop into the kind of person you want to become. You’ll learn how to recognize talent – both in others and yourself – and to strengthen areas in which natural talent may be lacking. Plus, you’ll learn how to take risks that are consistent with your personal style and comfort level. Today’s true leaders have no followers in the conventional sense of the word. And leadership masters go even a step further, by transforming followers into other leaders. Best of all, they know how to lead themselves to the achievement, success, and happiness they want from life. First and foremost, the principles will make you an effective leader of your own life. You’ll learn to make effective decisions based on your wants and preferences that will pull you automatically towards your goals. You’ll learn how to balance your leadership style with the rest of your life so you can reach true happiness and fulfillment in every area of your life. You’ll learn six secrets of effective time management, how to increase your energy, how to strengthen your inner resources – in short, how to control your life without letting it control you. You’ll learn to find warmth and enrichment from your family relationships, how to overcome any anxiety, no matter where it comes from, and how to bring a richness to your life experience in general. You’ll also learn how to carve time and space out of your busy life in order to think, reconnect with nature, and develop the ability of being alone with yourself. We urgently need leaders today. Our future depends on it. When you develop your leadership ability, you will be rewarded beyond your expectations. 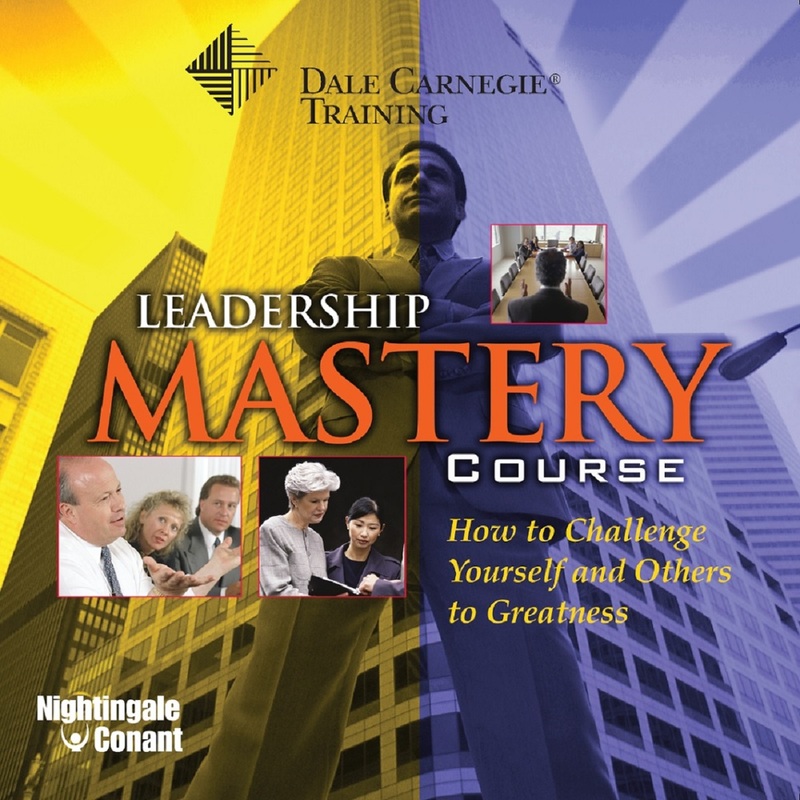 With The Dale Carnegie Leadership Mastery Course: How to Challenge Yourself and Others to Greatness, you will be able to lead your own life exactly where you want it to go! The secrets listed here are only a sampler of what’s available in the program. Learn all the secrets of leadership mastery by ordering NOW! There’s a world of information and opportunity waiting for you! The Dale Carnegie Organization partners with middle market and large corporations as well as organizations to produce measurable business results by improving the performance of employees with emphasis on leadership, sales, team building and interpersonal relations, customer service, public speaking and presentations and other essential management skills. The courses are available in 27 languages throughout the world; they cover the entire United States and reach over 70 countries. Dale Carnegie includes as its clients 400 of the Fortune 500 companies. Approximately 7 million people have experienced Dale Carnegie Training. Dale Carnegie’s corporate specialists work with individuals, groups and organizations to design solutions that unleash your employees’ potential, enabling your organization to reach the next level of performance. Dale Carnegie Training offers public courses, seminars and workshops, as well as in-house customized training, corporate assessments, online reinforcement and one-on-one coaching. I want to want to develop my leadership ability so I can earn more recognition and more money, develop more and have better relationships, influence scores of people so they do what I want! Please send me The Dale Carnegie Leadership Mastery Course for the special price below. I can select one of two ways of ordering.